Cristiano Ronaldo is not “cool.” It’s a little strange because he has many of the traits commonly associated with coolness—he’s famous, successful, cocky, handsome, has a body that looks like it was carved out of marble, has dated a number of the most gorgeous women in the world, etc.—and yet the overall package is decidedly not cool. The mix of his robotic affect coupled with the unmistakable scent of desperation that wafts from his many attempts to convince the world that he is in fact cool is probably what explains the discrepancy. This doesn’t really matter. Most people aren’t cool. Plenty of athletes, even the great ones, aren’t particularly cool either. Hell, Lionel Messi is the G.O.A.T. and he’s not only not cool, he’s actively uncool. Ronaldo has achieved greatness and success and presumably happiness beyond his wildest dreams. If his one failing in life is that he hasn’t established himself as a “cool” person on the level of Beckham or Zidane or Zlatan, then that’s hardly anything to lose sleep about. That said, just because you’re not cool doesn’t mean you should be lame. Not being cool is neutral. Being lame is bad. 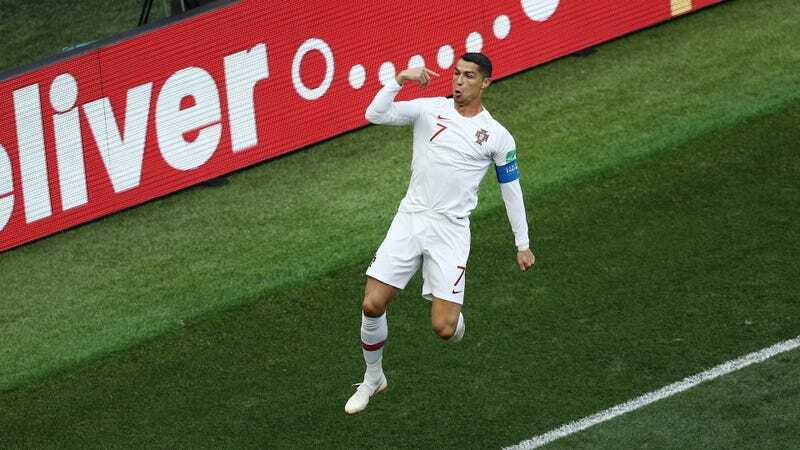 And the doofy celebration Ronaldo has unveiled at this World Cup is definitely very lame. What on earth is that? The main part of the celebration is a Ronaldo trademark, the part where he leaps in the air, does a 180 degree turn, and does a little flourish with his arms as he lands with his back to the crowd as if to say “Behold! It is I, Cristiano Ronaldo! Look upon the name on my back, and rejoice/despair!” Ronaldo seems to think this move is like super badass when in fact it seems like something a LARPer would bust out right after slaying Gnruuzlyth The Dreaded, but whatever. That celebration is fine. My mistake for assuming Ronaldo has any friends in the first place, I guess. Maybe there’s a good explanation for this that Ronaldo will eventually share with everyone and make us look like assholes. Maybe one of Ronaldo’s children (he has four now, three born in the past year, two of those new babies being twins born from an anonymous surrogate like his oldest kid, which isn’t really “cool” or “lame” but is incredibly odd) did a finger twirl like that once and Ronaldo incorporated it into his goal celebration as a loving nod to them. Maybe he knows it looks silly and he’s doing it to reassert his own coolness, essentially saying that he’s so cool he can intentionally do a lame thing and still be just as cool. Whatever the case, I hope he changes his mind. I know Ronaldo’s not going to stop scoring any time soon this summer, but my eyes can’t take too many more of these damn finger twirls.